If you would like us to speak to your genealogy society, please let us know. USA | Arizona | Youngtown - April 1, 8, 15, 22, 2008. West Valley Genealogical Society. Beginning Legacy Family Tree course. Millennia’s Geoff Rasmussen will teach a four-week series of classes related to beginning with Legacy Family Tree. Registration is required and seats are limited. Visit http://www.azwvgs.org/Classes.htm for registration and additional information, or call the WVGS Library at 623-933-4945. USA | Arizona | Mesa - April 2, 2008. Family History Society of Arizona, East Valley Chapter. The class will be an Overview of Legacy Family Tree. Held at Fellowship Square, Bldg. 4, 6945 E. Main in Mesa. Contact Bill Gertz for more information. USA | Arizona | Sun City Grand - April 3, 2008. The New Legacy 7 Preview by Geoff Rasmussen, sponsored by the Sun City Grand Genealogy Special Interest Group. 3:30-5:00. For more information, contact Leon Chapman at President@grandcomputers.org or call 623-398-8900. Held at Computer Club Classroom, The Chaparral Center, 19745 N. Remington Dr in Surprise. USA | Washington | Seattle - April 12, 2008. Seattle Genealogical Society Computer Interest Group meeting, 10:30 a.m. - 12:30 p.m,. at the Ballard Branch of the Seattle Public Library, 5614 22nd Ave. N.W. Seattle , WA 98107. 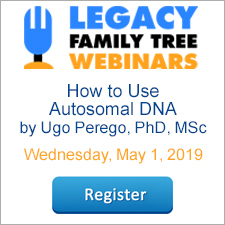 "Using Legacy Family Tree, Part II" with Sherry Holthe of Millennia Corp. Email SGSComputerSIG@Gmail.com for more information. Lunch is your own brown bag. We will furnish beverages and a cookie. There will be door prizes from Legacy. USA | Washington | Wenatchee - April 28, 2008. Wenatchee Genealogical Society meeting - East Wenatchee Fire Station Meeting Room, 377 Eastmont Avenue, East Wenatchee, WA (corner of 4th and Eastmont). The meeting starts at 7:00 pm. The program starts at 8:00 pm. Jim Terry of Millennia Corporation, will do a presentation “Introduction to the New Legacy Family Tree 7.0”. USA | Washington | Mount Vernon - May 16-17, 2008. Washington State Genealogical Society Conference at the First United Methodist Church, 1607 Division St., Mount Vernon, Washington. Download a registration brochure at http:/www.rootsweb.com/~wasgs. Please stop by the Legacy booth with your questions or just to say hello. USA | Missouri | Kansas City - May 14-17, 2008. National Genealogical Society Conference in Kansas City, Missouri, 14-17. Visit http://www.eshow2000.com/ngs/2008/ for more information. Attend Geoff Rasmussen's session entitled Citing Sources Evidence Explained Style Using Legacy's New SourceWriter. Held Thursday, May 15 9:30-10:30am. Also visit the Legacy booth for the latest products. USA | California | Burbank - June 27-29, 2008. Southern California Genealogical Jamboree 2008. Visit www.scgsgenealogy.com for more information. The Irish Family History Foundation, a network of county-based genealogical research centres on the island of Ireland, is now making their records available via an online research system (ORS). These centres have computerised just under 9 million Irish genealogical records, including church records, census returns and gravestone inscriptions. At present 16 of the 32 county genealogy centres have their details on-line, with a further 5 centres coming online in the coming months, and the remaining 11 centres hoping to follow suit in the not-too-distant future. The Irish Roots website (http://www.irish-roots.net/) will eventually hold details of all church records, which in some cases go back over 400 years to 1600. The site contains the largest online, searchable collection of Parish records for the island of Ireland. The complete indexes, which list surname, first name, year and county of ALL records is freely searchable. To view a detailed record you can purchase credit online for instant access for a small fee. 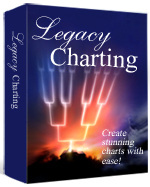 The release of our Legacy Charting Pre-Release edition has been a tremendous success. Hundreds of thousands have already begun their test drive. We have received many comments, suggestions, and even a few bug reports. This free update of Legacy Charting resolves several reported issues and adds one of the features you have requested. We would like you to install this update and let us know how it goes. Refresh Chart button. If you add/edit information in the original database (Legacy, FTM, PAF, etc. ), just click on the Refresh Chart button and those changes will appear in your chart. Fixed page update area in status bar when the user changes paper size. Fixed "Access violation at address 1B74295A in module "Dao360.dll"
Fixed "Out of Range" error in Tips & Updates section. Open Legacy Charting and click on the Tips & Updates tab in the upper right. In the upper left, click on the Download New Update Now link. This morning as I located yet another death certificate for a relative at the Arizona Genealogy Birth and Death Certificates site I thought to myself, "why don't all agencies digitize and publish their vital records online like Arizona has done?" 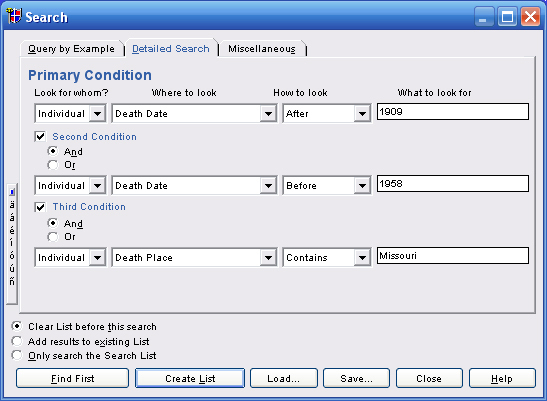 Imagine my excitement when I read the Ozarks Genealogical Society's article entitled "Missouri Death Certificates Now Online". According to the article, "over 600 students and volunteers from across the United States and other countries spent 32,810 hours preparing certificates for scanning and entering data into the index." The index, which is linked to the digitized images of the records, can be searched by first name and last name, county, and by year and month. Once a name is selected, a digitized image of the original certificate can be retrieved - at no cost. If you have Missouri ancestors, this is a valuable new resource. We wrote about it back in April 2006 when the index was first published, but now to have the actual images too! A great day for genealogy! 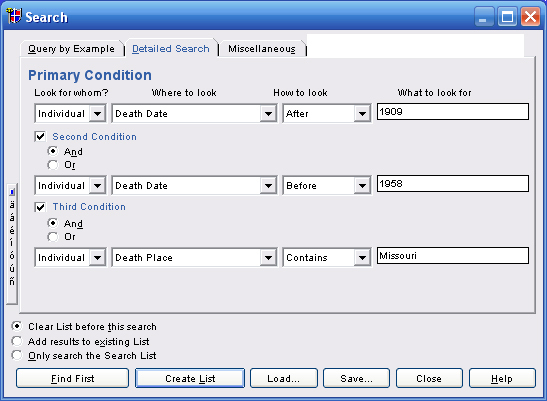 Click on the Search button in the main toolbar, then click on the Detailed Search tab. We have negotiated special prices on WorldVitalRecords.com for all Legacy Family Tree users. For the next 2 weeks (March 17-31st) you can sign up for membership on WorldVitalRecords.com for 2 years of the U.S. Collection for only $39.95 (Regular price is 1 year for $49.95) or one year of the World Membership for only $89 (Regular price is $149.95). WorldVitalRecords.com now has over 1 billion names online that will be very useful for your family history research. They have over 6,500 searchable databases and continue to add new databases each day. WorldVitalRecords.com was recently recognized as one of the 10 most popular genealogy web sites. They have also received many awards for their ease of use and fast searching. For UK researchers, they have the lowest-cost access to the UK census records. Exclusive Data from Everton Publishers – We provide exclusive data from Everton including over 200 issues of the Genealogical Helper Magazine (1946-2006). That is more than 40,000 pages of information to help you with your genealogy! We have also indexed more than 3.6 million names from Everton's pedigree files and family group sheets. Also included is access to the historic Everton Library, plus we add new data every month. This information is not available anywhere else online. SmallTownPapers® Collection - Discover your ancestors like never before…the people, places and events as reported in real time in their local newspaper. World Vital Records was selected to provide access to this archive of exclusive newspaper content, not available from any other genealogy source! This gives you access to a completely searchable digital archive that features small-town newspapers back to 1846. We currently offer nearly 1 million pages from this unique archive, and are adding more than 100,000 pages each month! Quintin CDROM Library – Get access to more than 10,000 exclusive databases that would cost over $4000 if you purchased the CDs separately! These will be coming online over the next few months. These are valuable and hard-to-find materials from many different sources. International Parish Register Collection – Your membership will include access to one of the largest collections of parish registers on the Web from many different countries, and we are adding more every day. World Gazetteer Collection – Search for detailed information on more than 310,000 places around the world. International Marriage Record Collection – Search through over 3 million marriages from all over the world. Exclusive Content Added Daily - Your membership includes easy access to many databases that are not available anywhere else on the Internet. Our content acquisition team is constantly working to scan and index information from libraries and archives around the world. This data has never before been online including vital records, family histories, books, gazetteers and maps. We add new databases to the site every day! Affordable Membership Cost – You get ALL THESE DATABASES for one low price. We are dedicated to providing the best genealogy and family history resources on the Web and we do it at a cost that ANYONE can afford. World Vital Records costs 75% less than other genealogy sites. Membership is just $2/month! Enroll with World Vital Records today and get a special discount to WorldVitalRecords.com because you are a Legacy Family Tree Software user. Just $39.95 for a TWO years of the U.S. Collection! Membership in World Vital Records provides many benefits including access to over 1 BILLION names including Everton's Online Library, our International Parish Register Collection and the Quintin CDROM library. Get access to premier data like Newspaper ARCHIVE, SmallTownPapers®, Accessible Archives, Find A Grave and much, much, more! Hurry because this special discount will end March 31, 2008. Our 5th annual Legacy Genealogy Cruise is getting closer. On July 16, 2008 we will debark from Dover, England and sail to Denmark, Germany, Russia, Finland, Estonia, and Sweden. Along the way you will attend classes taught by genealogy's DearMYRTLE and Legacy Family Tree's developers. Because we always have a large group, the Norwegian Cruise Lines has given us a substantial discount from their normal pricing. This special discount pricing ends this Friday, March 21. If you are interested at all, please call our cruise director, Christy, at 1-888-505-6997 as soon as possible. 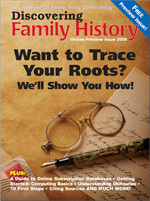 Discovering Family History is a brand new magazine dedicated to genealogy. In fact, it is the latest magazine from the publishers of Family Chronicle, Internet Genealogy, and History Magazine. This new bi-monthly magazine is targeted at people who are starting their genealogy, need a refresher course or are tackling a new aspect of genealogy. Discovering Family History articles are being written by some of the most respected book and magazine authors and many of them have extensive experience of teaching genealogy courses, either face-to-face or online. First Things First: Genealogy news you can use! Who Else Is Researching Your Name? For more information, visit www.discoveringfamilyhistory.com. Legacy Charting comes with a variety of different themes that you can apply to your chart. Each of the 18 different styles of charts can have a different look and feel by selecting a different theme. A theme is composed of colors, box styles, backgrounds, page borders, box content, sizing, and more. Click on the Themes button. Double-click on one of the Chart Themes. On the Appearance tab, click on the Background button. Locate any digital image on your computer, click Open, and adjust the transparency. It's never been easier to "show off" your family! If you have not yet download the free pre-release edition of Legacy Charting, visit www.LegacyCharting.com. New family tree charting software now available for download. Create ancestor charts, descendant charts, mother’s trees, father’s trees, fan charts, hourglass charts, bow tie charts, and DNA charts. Surprise, AZ – March 4, 2008 – All genealogists are invited to take a free test drive of the newest wall chart software. 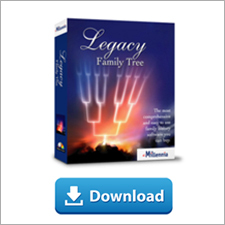 Compatible with Family Tree Maker, Personal Ancestral File (PAF), Legacy Family Tree, RootsMagic, and GEDCOM files, Legacy Charting takes publishing your family tree to a new level. Developed by the makers of the popular software, Legacy Family Tree, Legacy Charting adds new ways of seeing and printing your family relationships. Legacy Charting will be one of the new features with the soon-to-be-released Legacy Family Tree version 7, but until June 15, 2008, this special pre-release edition of Legacy Charting is freely available to everyone. To see what the charts look like, visit www.LegacyCharting.com/samples.htm. Millennia Corporation, based in Surprise, Arizona, is the producer of Legacy Family Tree and other software products.